Mikey is teaching up to 20 courses with unlimited personal demonstrations during the show. Some of the courses are part of the show’s seminars which are set up through the show. Mikey is teaching CROCHET SUPER STARS, GRANNY SQUARE BOOT CAMP, ROUND LOOMS, RECTANGULAR LOOMS and many more. The show is currently setting up the sponsors and times for this massive event. This is attended by 40,000 + People. Advertised around the world. Any one who sponsors me in upwards of $500 or more will get their company logo in the 80,000 publications and internet advertising on Mikeyssmail, You Tube, and Creativ Festival’s Web Spaces. We are going into the show as “Celebrities” which means newspaper and television interviews are a strong possibility. Included in this show will be two weekend long challenges! Build the LARGEST LOOM KNITTED BLANKET… and MAKE THE BIGGEST NEVER ENDING GRANNY SQUARE. Diva Dan and I will be appearing on the FASHION / ARTS Stage 3 times doing our regular MONDAY NIGHT BROADCAST once per day! 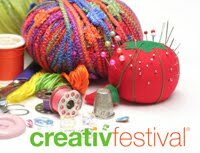 Included in this… our booth has been upgraded to a demonstration area to itself… Tables and Activities will be lined up throughout the weekend to learn many different things involving Crochet and Looming. Mikey and Diva Dan are going to need volunteers who want to come and represent us at the show. We can have up to 4 at one time. Volunteers don’t have to commit to a full weekend as we can run the Volunteers in shifts and pass your free pass to another person to use. We will also be broadcasting LIVE to the internet during the entire show from our booth! So you can snoop what’s happening and catch the free seminars Mikey is running right out of his booth! Also… want to see the PINK PURPLE AND SILVER CHRISTMAS in person! Our entire christmas theme is coming with us to the show! Take pictures with us, our tree or whatever! This entry was posted in Announcements and tagged Creativ Festival Web Spaces, Diva Dan, LIVE, Metro Convention Centre. Bookmark the permalink.